Roxanne Faber Savage, b. Boston, Massachusetts, United States of America; Currently lives and works in Connecticut and New York. Roxanne Faber Savage is an award winning multidisciplinary artist with printmaking as her primary medium. Roxanne creates works on paper and other substrates, pushing the boundaries of traditional printmaking. Her graphic imagery of elephants, swimmers, powerlines, clover, balls, moons and birds is developed through a mix of skill and intuition, using print, photography, and drawing techniques. Roxanne is a juried member of The Boston Printmakers, Silvermine Art Guild, and a recipient of Artist residencies including Mass MoCA "Artist in the Studios," North Adams MA; Atlantic Center For The Arts, New Smyrna Beach, Florida, and Weir Farm Artist Residency, Wilton ,CT. She is a dynamic educator and Master Teaching Artist on the State of CT Teaching Artist roster. 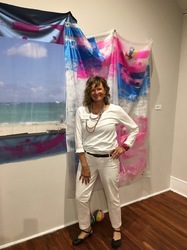 Her art works are held in private and corporate collections including Impala Asset Management, CT & FL,Bonanza Productions/Film & Television, NYC & CA; Ocean House, Watch Hill, R.I.; Becker & Becker Architects, OCTAGON LP, NY; Cohen and Wolf, P.C. CT; Goldman Sachs NY; RD Weis Companies USA and Unilever USA. Roxanne earned her BFA with honors, Pratt Institute and MS Ed., Queens College.